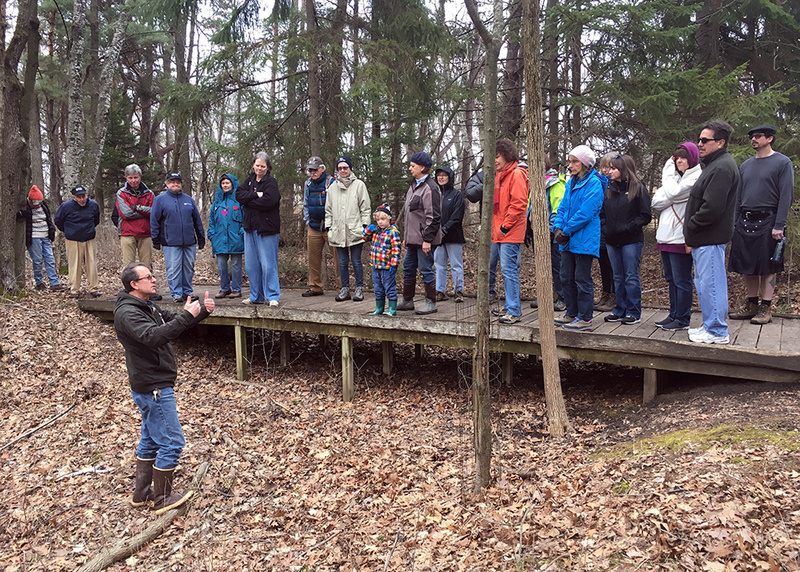 Although the day was dreary and colder than forecast (near the lake anyway), members of the Sierra Club, who are a hardy bunch, showed up in good numbers for a guided tour of Schlitz Audubon Nature Center on Saturday. Our guide was Marc White, Director of Conservation, who regaled us with a wealth of information about the Center and especially about a couple of restoration projects that are just getting underway. 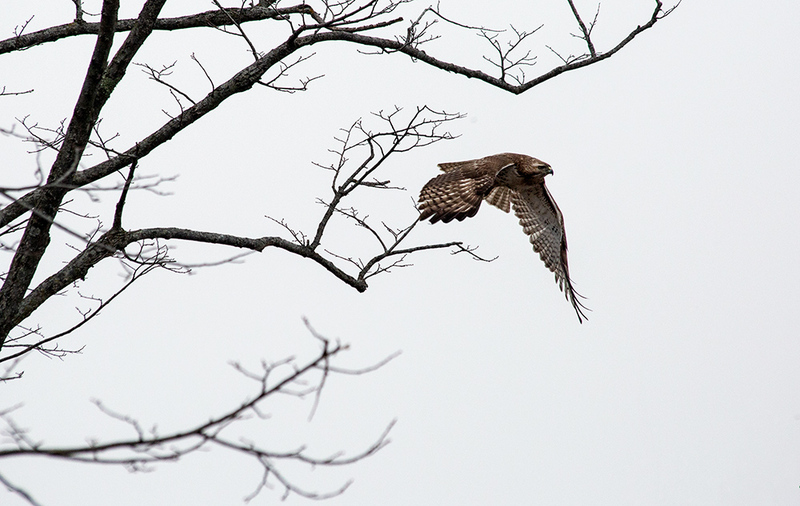 Along the way we caught glimpses of wildlife, some of which I managed to catch on camera, like the immature red tailed hawk above and the downy woodpecker below. Pop quiz: When is a ravine not a ravine? 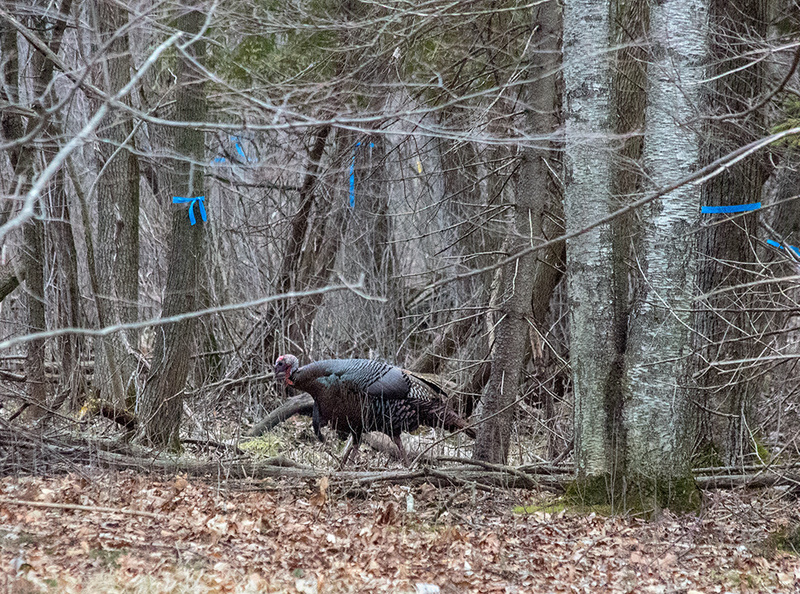 Answer: When it is a gully. Although the two kinds of eroded cuts into the landscape may look alike, according to White a ravine occurs naturally–and there are many along the kinds of bluffs that face out onto the shore of Lake Michigan. A gully, on the other hand, is caused by runoff from human-altered landscapes, such as the farmland that once existed here. The North Ravine did not begin to erode into the bluff until farming began on this site–about 150 years ago–which makes it a large gully. The local chapter of the Sierra Club is the Great Waters Group, here with our guide for the tour, Marc White, on the North Ravine Trail. The ravine/gully is in the first stages of a project to stabilize the erosion that has created it. It was impossible not to notice the great number of logs lying about pretty much everywhere we went. 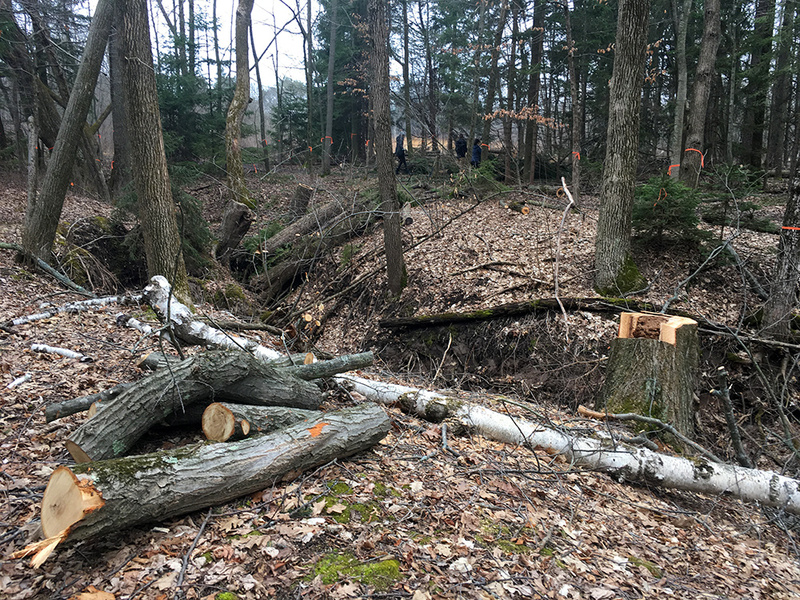 Some of the tree-cutting is needed for the restoration projects, White told us. However, most of it is ash trees that have been infested with the invasive emerald ash borer. Hundreds of ash trees have died and any that threaten to fall where they might hurt someone must be cut down. The Center’s policy requires that at least two thirds of the wood that results must remain in situ as habitat and to decompose. 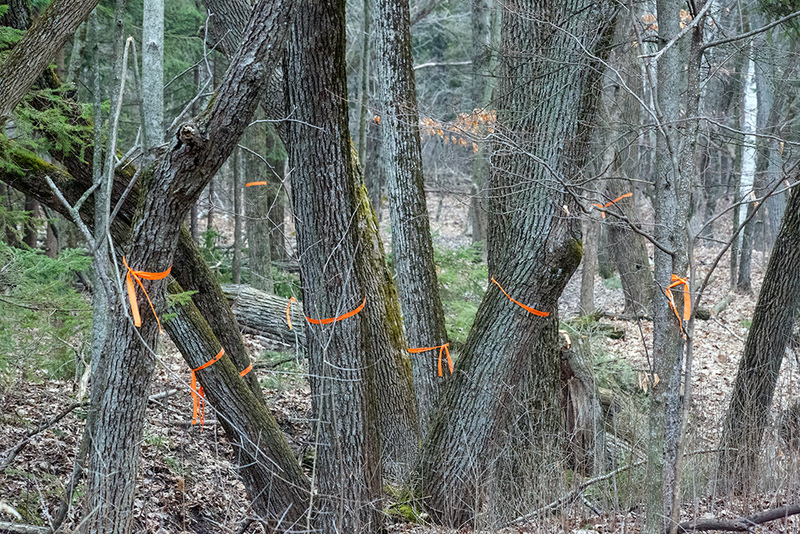 Orange ribbons are attached to “high value” trees that will not be cut. 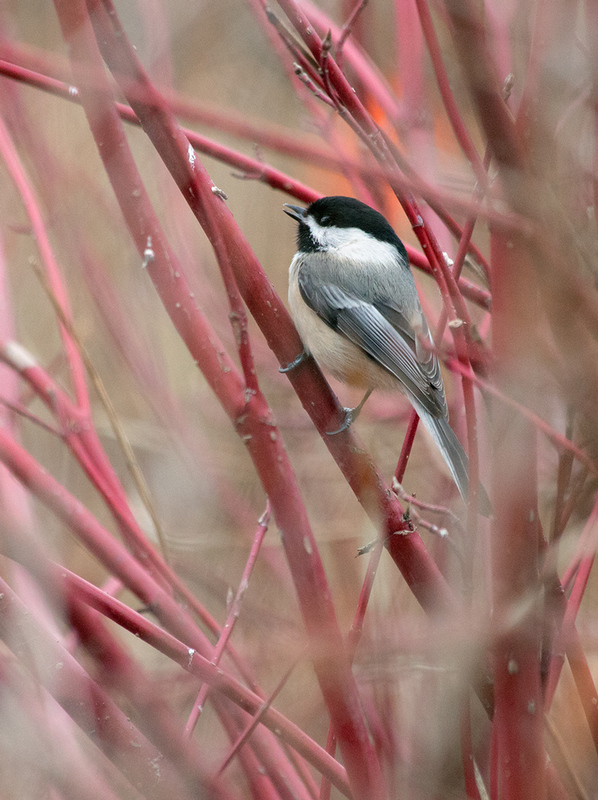 A black-capped chickadee among red osier dogwood stalks. 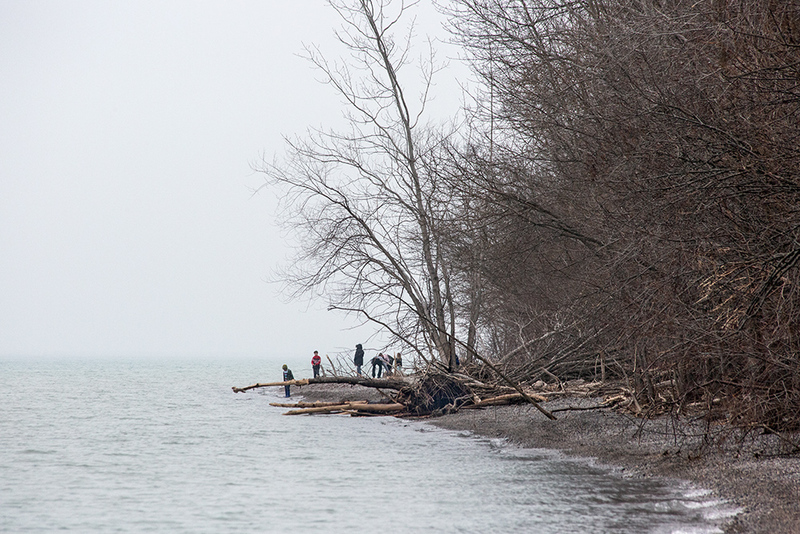 Despite the gloom, people were out enjoying the rocky beach along the Lake Michigan shore. 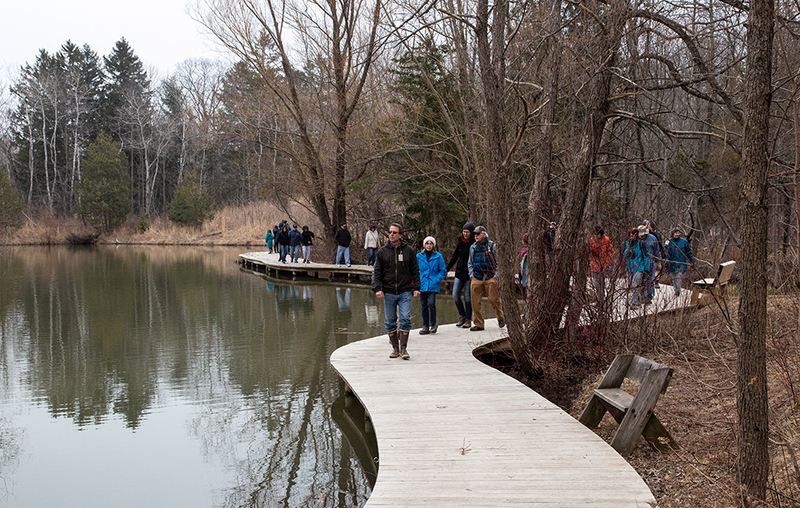 Marc White leading the group along the Mystery Lake boardwalk. 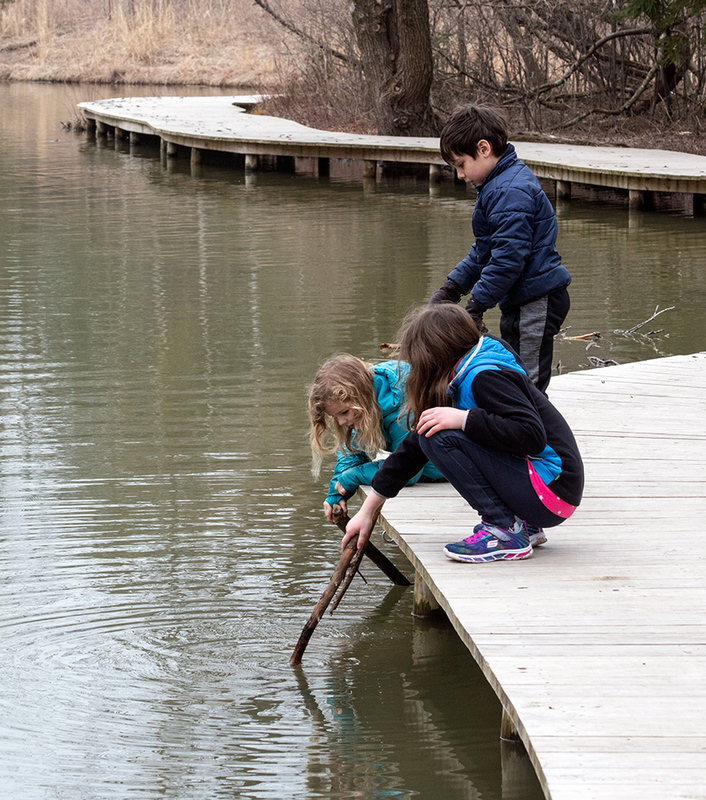 Kids pausing to probe the depths of Mystery Lake. 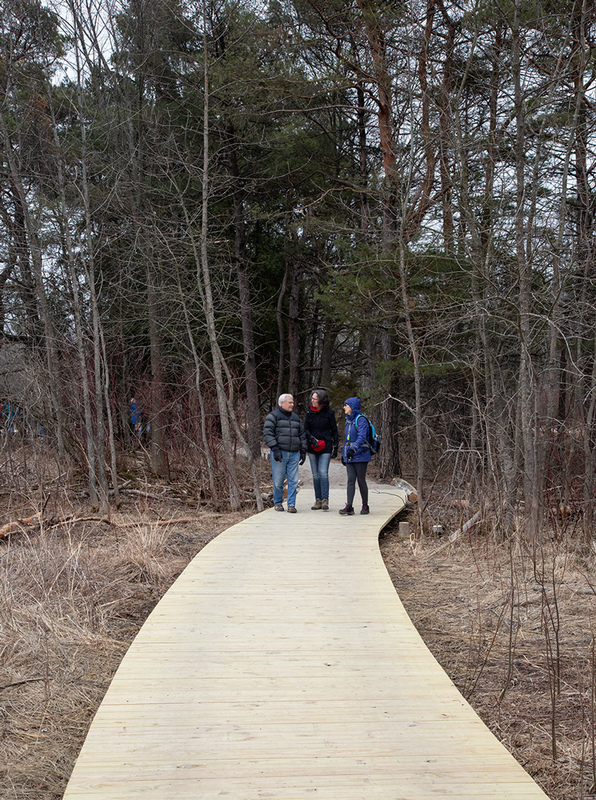 A newly installed wetland boardwalk. 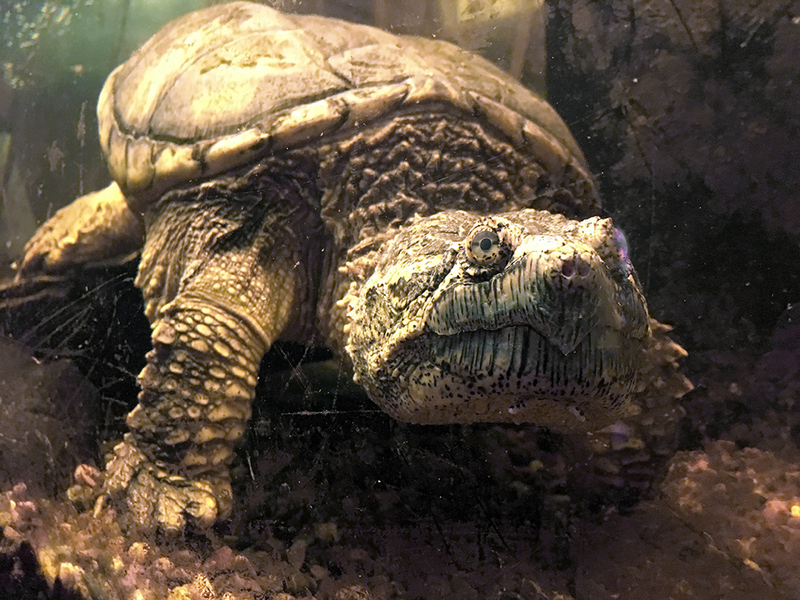 Back inside the Dorothy K. Vallier Environmental Learning Center, make sure you meet Emerson, the snapping turtle. 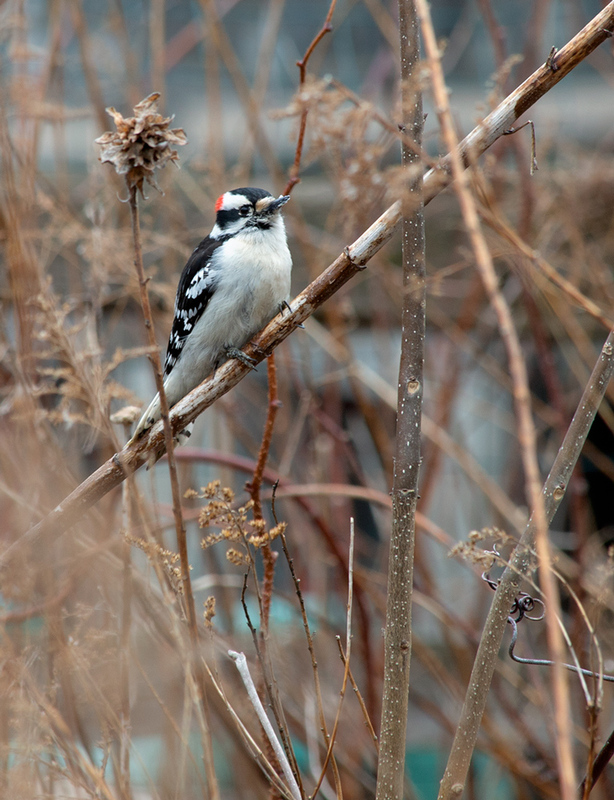 You too can learn all about the the Schlitz Audubon Nature Center’s 15-year conservation plan on May 20, 6:30 – 8:30 pm. The conversation begun on this guided tour will continue as “Conservation Strategies and Implementation” is presented by Marc White to the public as well as to the Sierra Club/Great Waters Group, which will reconvene at the Center for its monthly program. Eddee Daniel is a board member of Preserve Our Parks and a member of the Sierra Club/Great Waters Group. 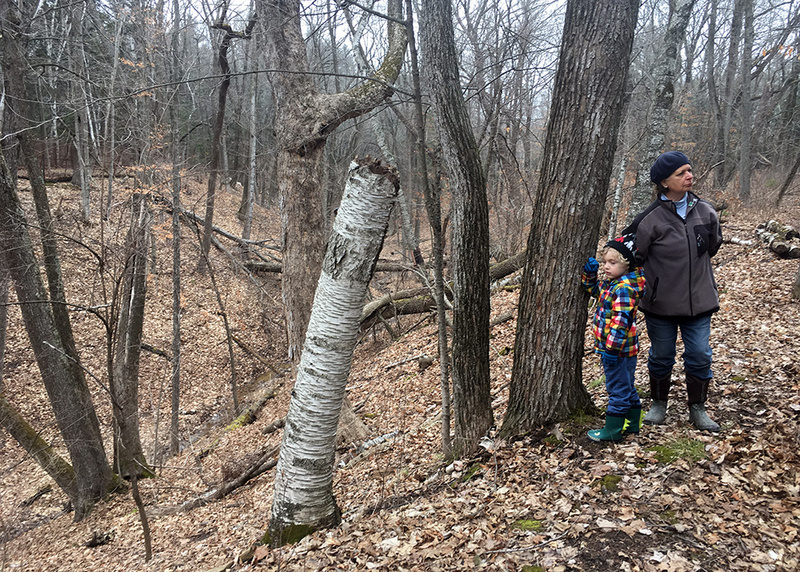 Schlitz Audubon Nature Center is a project partner of A Wealth of Nature. A Wealth of Nature is a project of Preserve our Parks. ©2019 A Wealth of Nature | Privacy | Site Map | Website By GT Creative, LLC.